Why Asian Rhinoplasty Is Different From A Traditional Nose Job? Being the largest continent in the world, Asia is home to numerous ethnic groups. But although there are significant ethnic nasal and facial variations among Asians, they are often stereotyped by Westerners. The influence of Western culture combined with the impact of globalization and the strength of native economies has altered the Asian concept of beauty over time. Hence, the growth of cosmetic surgery has been skyrocketed among this population and rhinoplasty is known to be the second most popular one among them. Nowadays, most Asians undergoing Asian rhinoplasty to enhance their appearance by achieving a higher nose with better definition while preserving their ethnic identity. Keep reading as we reveal different facets of this surgical procedure through this article. Before exploring Asian rhinoplasty, it is important to understand the underlying nasal anatomy of Asians. Even though there are anatomic variations among different ethnic groups, Asian noses have quite a few similar features. A typical Asian nose is small in both height and width due to the presence of a smaller structure of bones. It has thick skin with a low dorsum, a short columella, and a low radix. The nasal tip comprises lots of fibrofatty tissue, which makes it under projected, poorly defined, and bulbous. The lower lateral cartilages in Asian noses are weak while the alar lobules are thick and alar bases are wide. The retracted columella and premaxillary hypoplasia also make the nasolabial angle acute in them. In addition, the nostrils look round and more flared. This unique nasal anatomy prevents Asians from being right candidates for a traditional nose job (1). Asian rhinoplasty or ethnic rhinoplasty is a special version of the traditional rhinoplasty surgery. It focuses on adjusting the noses of non-Caucasian patients so that they become well-balanced with other facial features and flatter their natural ethnic beauty. Either silicone implant or adequate natural tissue is required for Asian rhinoplasty. The cartilage needed for this surgery is usually taken from the nose itself. But it can also be harvested from the ear and the rib. However, finding the right plastic surgeon having immense expertise and experience in Asian rhinoplasty is essential to enjoy the best possible results. Most Asian rhinoplasty surgeries revolve around the projection of the nasal tip or the augmentation of the nasal dorsum near the eye area and the upper cheeks. However, each patient wishes for a different degree of nasal refinement, which makes it complicated and considerably different from regular nose jobs. The surgical procedure needs to be customized based on the unique anatomy of the individual patient as well as her desired appearance. Therefore, a careful preoperative consultation is imperative for aligning the expectations of the patient with the limitations of the surgical procedure. It also helps the surgeon gain an understanding of the best technique to administer for making subtle refinements that look natural (2). Also Read – The A-To-Z Of Chin Augmentation – Get Ready For A New Chin! An ideal candidate for Asian rhinoplasty is one who wants to alter her nose profile subtly (by elevating the bridge of rectifying a structural deformity) while retaining her racial identity. She should be an individual of any age and skin type with an overall good health and realistic expectations. General anesthesia is administered to provide the highest level of care to the Asian rhinoplasty patients. However, intravenous sedation can also be used. Your surgeon adopts an open surgical technique and makes a slight incision along the base of your nose depending on how much correction is needed. This ensures that the scar remains hidden in the crease (philtrum) made by your nasal base and your upper lip. Then, a silicone implant (mostly ‘L’-shaped) or cartilage taken from patient’s own body (septum, back of the ear, or rib) is placed near the nasal tip according to the requirements. Finally, the surgeon closes the incision with absorbable or removable sutures, place stents, and covers the wound with a dressing. Asian rhinoplasty takes around 2 to 3 hours to finish and it can even be longer sometimes. 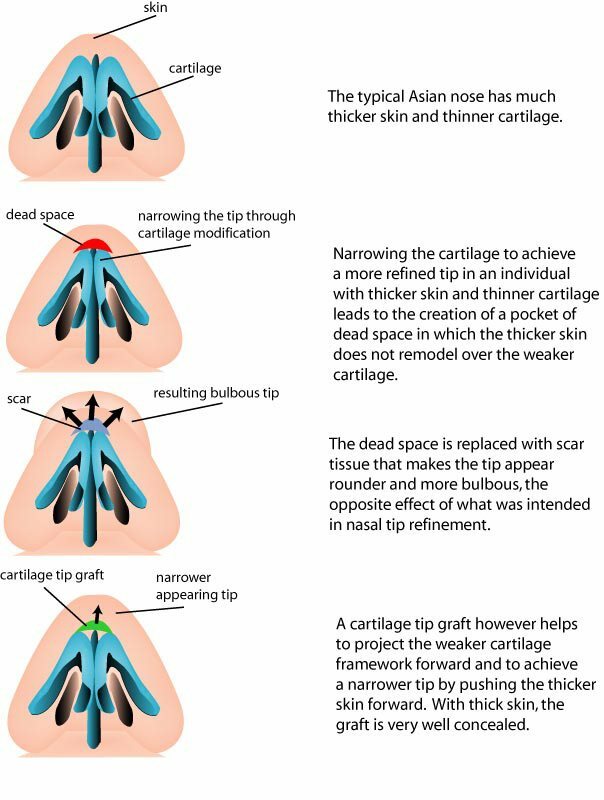 Though your nasal tissue and cartilage will heal and settle into the refined shape and position gradually, the final results will only surface after several months or even a year. Mild swelling, a little tenderness, and minimal bruising are common following the surgery, which diminish within 1 to 3 weeks. You may be placed on oral antibiotics for 6-7 days. Refining your nasal tip will require a taping of the nose for a week. This will control edema while providing uniform healing. If you have undergone more than a nasal tip refinement, you may have to wear a plastic splint for the first 7 days after the procedure. Make sure to keep your nose dry in order to prevent the splint from falling off. Internal silicone splints used during the surgery can be left for 4 to 7 days before removing. Once the splint is removed after a week, you can resume your daily activities. After one more week, you should be able to start moderate physical activities. However, do not get involved in contact sports for at least 6 months as it can injure your nose. Stay away from smoking and stop taking certain medications (aspirin, salicylates, etc.) to promote healing. Your scars should fade away over time and the full healing might take almost 12 months. Every invasive surgery comes with some risks and so as the Asian rhinoplasty. Most common complications experienced by patients are hyperpigmentation, hypertrophic scarring, prolonged edema, graft visibility, graft resorption, asymmetry, etc. Other complications that are related silicone implants include infection, translucency, skin discoloration, extrusion, displacement, mobility, calcification, and capsular contracture. The average total cost of an Asian rhinoplasty surgery can range from $5,000 to $10,000. It varies depending on the corrective needs of the patient as well as the procedure performed by the surgeon for achieving the best results.